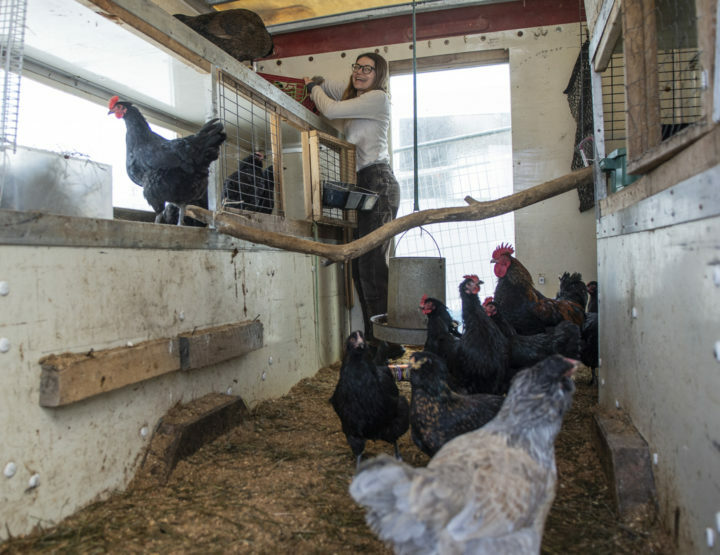 A hen waits her turn to be fed as Mandy Wheaton feeds goats at her farm in Bucksport on Thursday. The farm is changing its name to avoid trademark infringement claims. 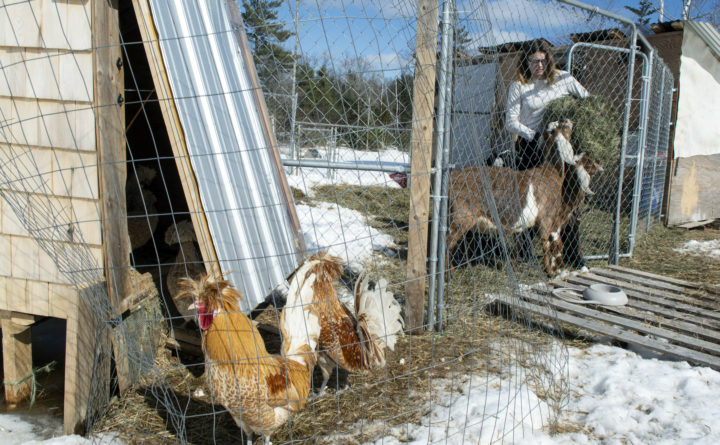 Mandy Wheaton feeds goats at her farm in Bucksport on Thursday. The farm is changing its name to avoid trademark infringement claims. The Wheatons received an email March 7 from Fredrica Drotos, a business affairs specialist from Middle-earth, who asked the farmers to stop using the name for their farm. Mandy Wheaton was stunned at the request. “You have got to be kidding me,” she wrote back to Drotos. 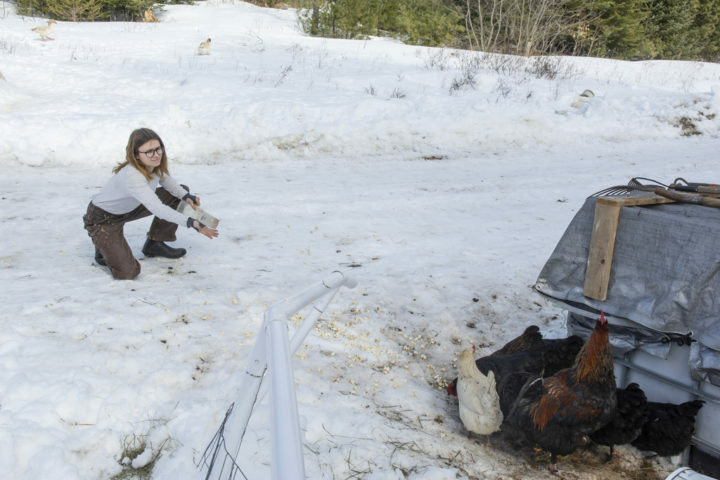 Mandy Wheaton feeds chickens at her farm in Bucksport on Thursday. The farm is changing its name to avoid trademark infringement claims filed by the owners of the works of JRR Tolkien. Alas, no. The Wheatons, Drotos said, had encountered a reality that might have seemed like Tolkien fantasy in the pre-internet age — the ability trademark holders have to find trademark infringement around the world. Drotos said that she has no trouble believing that the Wheatons were innocent of any nefarious intent when they chose to honor Tolkien’s work by naming their farm after it. 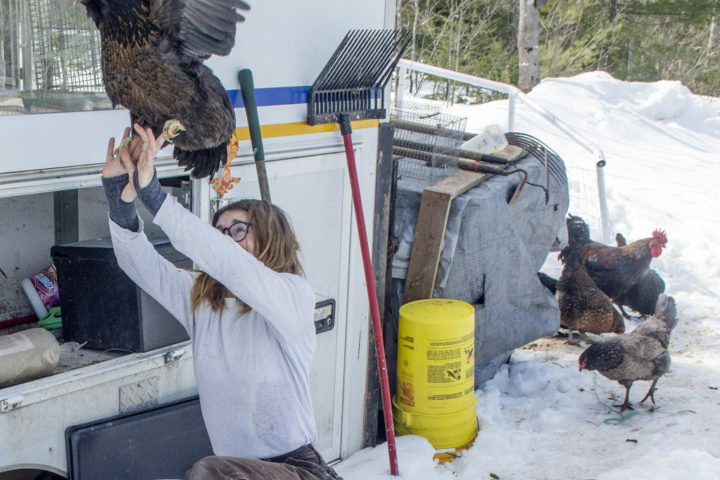 Mandy Wheaton plays taxi to one of her animals at her farm in Bucksport on Thursday. Companies spend millions of dollars defending intellectual property from theft, and it’s generally a losing battle, Drotos said. According to a U.S. Trade Representative report published in April 2018, systemic intellectual property theft just in China costs American companies at least $50 billion per year. The Wheatons’ case was never that severe. The farm raises nubian dairy goats, fresh eggs, garden vegetables, and silver fox and Flemish Giant rabbits. She expressed some consternation, but Mandy Wheaton agreed to change the farm’s name. She soon discovered, however, that unwinding a year of marketing wasn’t as easy as, say, Gandalf waving his walking stick. Mandy Wheaton's passenger doesn't want to end the ride at Wheaton's farm in Bucksport on Thursday. The farm is changing its name to avoid trademark infringement claims. “We have already been here a year, and I am already so established as Hobbit Hill that people tag me on pages on Facebook and I get people referring customers to me,” Wheaton said. 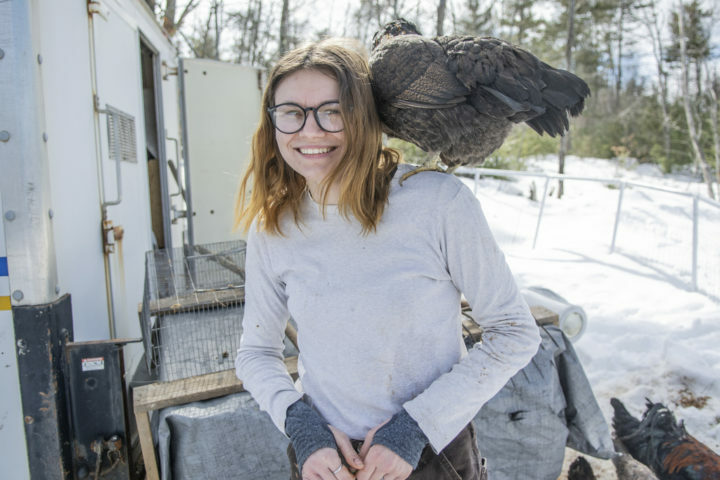 The farm mails hatching eggs all over the country to be incubated at other farms, so the name tangle has serious repercussions, she said. The Wheatons might have faced the same problem had they named their business after a gnome or a leprechaun. The word “gnome” appears to be the legal property of The Gnome Foundation, while the University of Notre Dame claims to own icons such as the leprechaun and shamrock. Mandy Wheaton checked, she said, and found no trademark issues with the farm’s new name — Wheaton Mountain Farm. “We don’t expect to hear from Wil Wheaton,” she said.